Not just another book on marketing. Tags: Digital marketing, social media marketing, online marketing, content marketing, growth hacking, entrepreneurship, small business. You know people want what you’re selling, but you’re not sure how to reach them. You’re tired of selling, but your business needs sales. You want real marketing ideas you can implement today. I had low expectations going into the reading of this book. 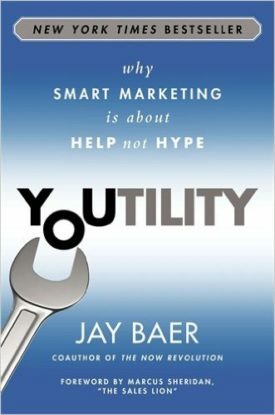 I didn’t really know anything about Jay Baer, hadn’t read any of his other books, found the book cover lacking (as a designer I can’t help but judge books by their covers), and I’ve read soooo many books on marketing and have found so many of them to be derivative and copies of everything else out there that I assumed this would be another book that was good, but merely repeated what everyone else has already said. But I was pleasantly surprised by Youtility, and not just because I had low expectations (although I frequently use that trick to improve my experience watching movies). Youtility is expertly written. It’s polished–not just a bunch of business experience quickly cobbled together. While it does cover things I’ve learned in other books and in real life, like how helping people creates trust and is the better way to “sell” without selling, and that in order for your company to succeed it must provide something useful (duh), it does so in a way that is both convincing and motivating. Most of us accept these concepts and will pay lip service to them, but I walked away from Youtility saying “I need to do something about this right now, and now I know how.” If you’re tired of selling and want customers to come to you already sold, this book shows you how to make that happen. A simple example would be to set up a blog on your company website and start answering real questions from real customers. Easy, but most companies don’t do this. But that’s just one small tactic from the book. Read it to learn about many more, with case studies showing you how others have done it and succeeded.